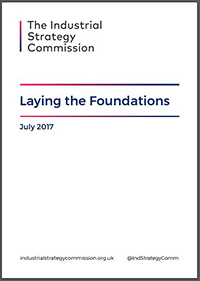 The Industrial Strategy Commission has today published its first major report, Laying the Foundations. The report outlines the key foundations for a successful long-term industrial strategy. The Commission, an independent, authoritative inquiry into the development of a new, long-term industrial strategy for the UK, has been established jointly by SPERI and Policy@Manchester and is chaired by Dame Kate Barker. Dr Craig Berry, Deputy Director of SPERI, and Professor Richard Jones, SPERI Associate Fellow and Professor of Physics, are members of the Commission team. Tom Hunt, Policy Research Officer at SPERI, manages the Commission’s work. Laying the Foundations argues that UK has a compelling need to introduce a framework for strategic economic management – and needs an industrial strategy with a positive vision for our future. The report also outlines the serious and longstanding weaknesses and challenges affecting the UK economy – and the significant opportunities. Find out more about the Industrial Strategy Commission here. As it prepares a new strategy, the government must think about industrial strategy as strategic economic management. It involves the long-term co-ordination of all interactions between public and private sectors. It should become the organising framework for UK supply-side economic policy. Industrial strategy is not about the government handing out money to chosen businesses or sectors. The state’s role is to create the conditions for long-term investments in productive and innovative business activity, ensuring the economy is geared towards meeting key national challenges. The Commission has identified seven themes that the Government must ensure are the foundations of a new industrial strategy. The foundations are: a long-term set of institutions to determine, implement and monitor a new strategy; recognition of the importance of place and the need to increase growth and productivity everywhere; a joined-up approach to science, research and innovation; a strong competition regime; an increased investment rate; a comprehensive effort to improve skills, and effective use of the state’s purchasing and regulating power. The new strategy must be informed by a positive vision of a future destination for the UK. This can be achieved by reframing the challenges the country faces as strategic goals to be met. These goals are: decarbonisation of the energy economy; ensuring adequate investment in infrastructure; developing a sustainable health and social care system; unlocking long-term investment; supporting high-value industries in building export capacity, and enabling growth in all parts of the UK. Follow the Commission on twitter @IndStrategyComm and sign up to receive updates about the Commission by email here.